Seattle-based hip hop voyagers Shabazz Palaces produce transcendental albums from an intuitive frame of mind. 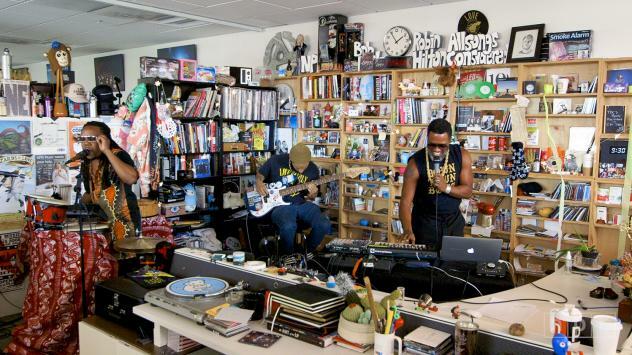 Following the release of their two new 'Quazarz'-albums, Ishmael Butler, Tendai Maraire, and Otis Calvin (OCnotes) visited the NPR offices to record a new Tiny Desk Concert. Watch below, featuring the songs 'Colluding Oligarchs', 'They Come In Gold', and 'Shine A Light'. Shabazz Palaces is one of our guest curators for Le Guess Who? 2017; their program features jazz icon Pharoah Sanders, Gonjasufi, OCnotes, Fhloston Paradigm, and Natasha Kmeto.